Can’t say that in English? Some experts believe that no other language other than the English has as many words – in fact, the English language is counting more than one million words. Out of the around 6.000 spoken languages on Earth, it is easy to consider that the English language will have a word for everything right? Well, apparently it doesn’t. According to Babbel: ‘since all of the spoken languages provide slightly different ways of seeing the world, no one language can perfectly encapsulate the entire human experience. Conversely, every language on Earth contains certain words that don’t exist in any other language. Desenrascanço is the M.O. of any high-functioning procrastinator. Not only does it mean to solve a problem or complete a task, it means doing so with a completely improvised solution. We’ve all done this before: by trying to fix a small problem we create a bigger problem. Perhaps you tried to repair a flat tire on your bike, and now the wheel won’t turn? No matter which language you speak, from time to time you probably admire the moon’s reflection on a body of water. But unless you’re Turkish or Swedish it’s impossible to describe this beauty with a single word. The Swedish mångata literally translates to “moon-road”, an aptly poetic description. Turkish also has a very specific word, gümüşservi, but it’s not really used in everyday speech. It’s far more common to call the moon’s reflection on water yakamoz, which can be used to describe any kind of light reflecting on water, or even the sparkle of fish. 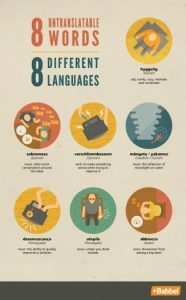 Are there any unique words in your native language that you would like to share with us?